Despite having long supported Democrats (and specifically black cats), renowned scientist and precocious intellectual “Poindexter” has in a shocking reversal of tradition announced he will endorse the McCain/Palin ticket. “I’m tired of hearing that all intellectuals support Obama” said Poindexter. “The guy doesn’t have a handle on free-market theory. Besides, after seeing him try to dance on Ellen… I’m pretty sure he’s lying about being black. I wanna see a birth certificate. 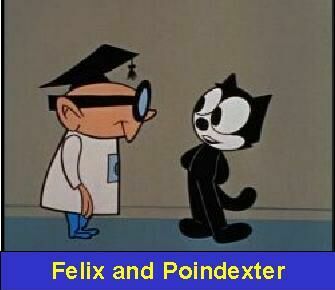 As many know, Poindexter has been friends with Felix the Cat for over 40 years, and as expected this news has caused a rift in their relationship. Does this Signal a Shift in Cartoon Loyalties? The verdict is still out. Poindexter’s announcement wasn’t entirely a surprise, as Rocky the Squirrel, Underdog, Mighty Mouse, Dudley Doorite, and George of the Jungle had already led the way of Toons for McCain. On the other side, Bullwinkle, though initially a McCain supporter, was violently opposed to staying in the camp as his Moose Rights party defected en masse after the announcement of Sarah Palin as the VP candidate. “Face it” said Bullwinkle… “this is a civil rights issue we just can’t ignore“. Meanwhile other noted cartoon characters such as Boris and Natasha, Snydley Whiplash, both Pinky and the Brain, and Alec Baldwin have long been firmly entrenched in the Obama camp, although several have publicly objected to Baldwin’s presence. Figure if we’re gonna get an announcement for each and every person that endorses Obama I oughta throw in a few of my own. I figure this one means about as much as all the others. Kinda sorry we lost Linsey Lohan though, she’d have been a lotta fun at the parties. Previous Post Joe the Plumber… Why all the ruckus? I saw on Fox that a group of dems had a fundraiser for McCain and raised half a mil for him. I wonder if that was reported on other stations?